I just finished delivering this workshop at the regional IB event held at Canadian International School, Hong Kong, an expansive and well-connected campus full of enthusiastic and dedicated educators from September 13-15, 2013. I was blessed with 23 teachers interested in learning more about effective implementation of technology within their Programmes of Inquiry (POI). Naturally, there were many who were also interested in developing their understanding of digital-age learning practice in general as well as looking to develop skills with the technology. All were open-minded and generous in sharing and learning with and from everyone else. 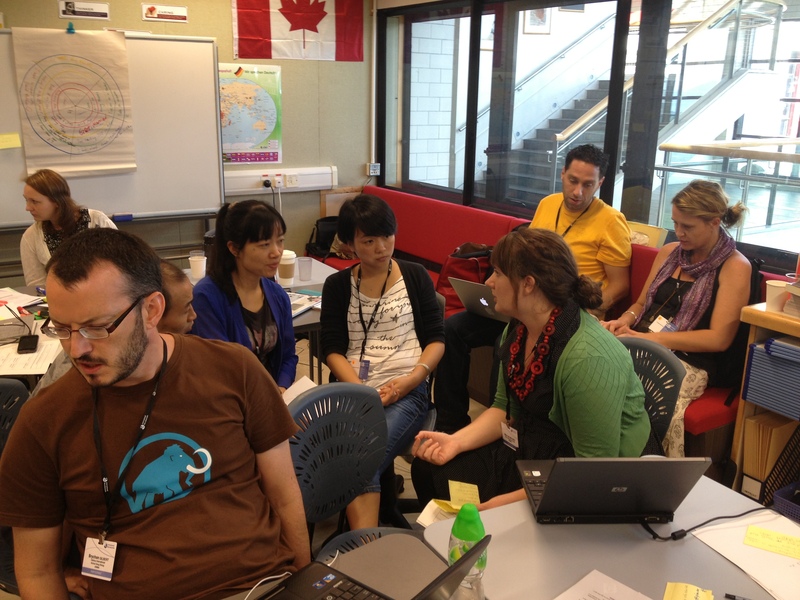 They particularly appreciated the Unconference opportunities to learn more directly from their peers. There was a particular group, however, (well two, really I suppose) that were grappling with how to best schedule and plan for collaboration in order to maximize the results for their students. I promised them this blog post so here we go. It doesn’t happen by accident. You need dedicated shared planning time. But it goes further than that too. Ideally, the collaboration starts in the planning session but continues in the classroom. Technology specialists are best utilized when they are working alongside teachers in the classroom. Students benefit from greater opportunity for one on one input as needed and the classroom teachers benefit from the professional development of learning on-the-job. We then turned to the problems of how best to plan and how best to execute. Is it ok to focus on skill development? Does everything need to be done in line with the POI? One of the things that drew me to technology as a PYP practitioner in the first place was the natural connection between digital-age learning and inquiry. While using Web 2.0 tools to further develop & uncover understandings and skills in your unit work you further have access to the simultaneous development of skills & knowledge in this realm. Whether you decide to focus on your Summative Assessment Task or some other area of your curriculum, be it Math, Science, Language, anything, given the fact that these are already integrated into your units of inquiry the connections to higher order thinking and conceptual learning are already there, ready to be exploited and magnified through careful planning & execution. When dealing with younger students, or those who have limited prior knowledge of basic skills, as with some other elements of your curriculum, these skills will need to be taught explicitly and that… is… ok. While it is natural to look for connections to summative assessments (and incorporate formative assessment strategies on the way there) any connection to the unit, concepts and/or lines of inquiry will support students in developing deeper understandings of the transdisciplinary theme. Time is of the essence. Instead of one class/week with a class it may be more effective to choose units from all classes that you teach to see where a technology connection seems best suited. For example a teacher with 18 contact hours across three year levels with 6 classes each can only see each class once/week. Perhaps they will would be better served by a different approach. Now all students can benefit from access to technology twice/week at an opportunity with an authentic fit with the curriculum. They learn better and no one has any less instructional time. Their skills with the tools improve alongside there Approaches to Learning skills and support them with their development of the deeper understandings planned for by their teachers. What do you think? Please leave a comment for me and my class. This entry was posted in Digital Learning, IB, Project Based Learning, PYP and tagged 21st century, classroom, collaboration, collaborative, digital age, education, future, higher order, ICT, integrate, integration, making connections, new thinking, skills, Tech, technology. Bookmark the permalink. At our school, we are using a similar approach. In the first year of having coaches, we are asking each year group to have a UOI that specifically will have ICT integration throughout. This comes as no surprise. Everything I heard of your school last weekend makes it seem like a great place to be part of a technology integration team. Thanks again for all of the great ideas and materials you shared with me. I know that I will be using them in the future. I am sure I’ll be seeing you again. In the meantime, let me know if your school needs anymore Canadian techies, eh? Haha…yeah, I have come to realize just how lucky we are here. My boss has an awesome vision and has really pushed forward in the right way. Keep tabs on our school if ur ever interested in making a move to Honkers as, like any school, there is always staff turnover. At our school, we have slotted ICT lessons twice a week, which are used in integration with the ongoing UOI per grade level. We also have an ICT led UOI in Year 5 which is based on Technology. Moreover, we integrate ICT as a tool for learning incorporating iPads and Web 2.0 tools, making learning so much more engaging and fun! Hey thank you for sharing! Another advantage of technology in the age o connectivism… being connected! Thank you for this post Sean! I have shared it with our PYP administration and hopefully we can get some things moving in the future at our school. Technology doesn’t need to be an extra that takes away from the content…however many teachers have trouble thinking about it that way. As I’ve looked through upcoming MYP training, technology integration offerings seem to be lacking. I hope the IBO will continue to encourage training with a technology integration (not Design) focus.